We're getting on the ferry to Fire Island! It's been 3 years since our last vacation there, our favorite place to collect as a family. Easy days, good times. While I'm away, the blog is loaded up with a new set of postcards. The images are from that earlier trip and another, but things don't change much from year to year. We are fortunate to be able to say that and will certainly be especially grateful for the unspoiled shoreline this time. Enjoy your summer days and the holiday weekend! He likes to say that every day is Father's Day. He's so proud of his girls. Our turn to say it though- Happy Father's Day, Andy! And this year especially, our turn to be so proud of you! For awhile now, I've been trying to finish my stitch book started for my students at Squam. No reason to rush except that it's a pleasure to work on. Like knitting, it fits in my handbag and is work-able in most situations. Freehand flowers on linen stitched in the car on the way back from Indiana in May. 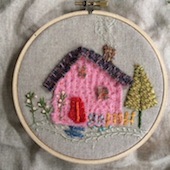 I'm fond of old textiles, wool, pearl cotton, french knots and chain stitch. And white on white- or nearly so. Backstitch meandering on a last little scrap of wool blanket. Threaded running stitch (fun!) attempted on the way out to IU. Feather stitch is my favorite go-to stitch. Double feather below. Bullion stitch (far right) ... essentially a long french knot. Little bits and a lost nametag I made for Squam, misplaced and then it surfaced too late. Almost finished. Might have to make another stitch book for summer. It's here.